Here’s a good and funny article on the next generation of game consoles and what gamers will want from them, regardless of game company hype – A Gamer’s Manifesto. The Sony Playstation 3 is going to cost $465.00. In the desolate economic climate of post-apocalyptic 2006, I’m thinking that’s going to be a lot of money. Now, it’s true that at E3 Sony was boasting the Playstation 3 could crank out 1.8 TFLOPS, or 1.8 trillion FLOPS. If that many FLOPS were piled together they would fill the Grand Canyon, assuming each FLOP were the size of a muskrat. So what do gamers want from all that money and FLOP? Just ask them. Here’s a bit of good news for all flight-sim lovers; developers Lead Pursuit have announced the release of Falcon 4: Allied Force on june 28th. 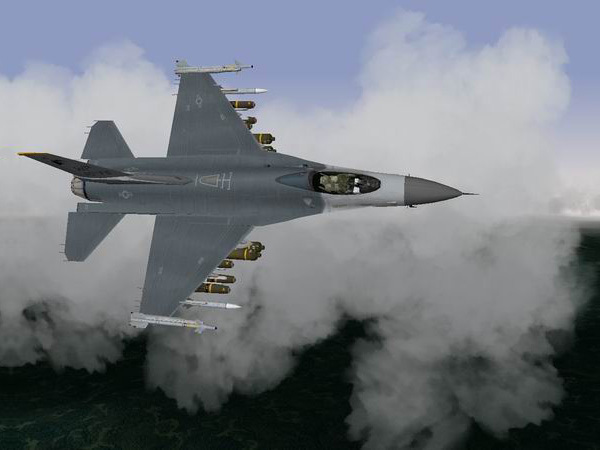 Based on the legendary Falcon 4.0 F-16 combat flight simulator, Allied Force features extensive improvements in all areas including artificial intelligence, graphics, multiplayer, terrain and of course the stunning real time, fully dynamic campaign engine. There is also a brand new theater of operation, the Balkans, in addition to revised campaigns for the Korean theater. The screenshots look absolutely terrific, and they even promise to include a 100 page printed(!) manual with the game, really rare these days. I’m Still Seeing Breen – Amazing music video featuring stunning action footage from the Half-Life 2 game, the G-Man on ‘vocals’, and of course the compulsory nu-metal soundtrack. Machinima’s a new form of filmmaking that uses computer games technology to shoot films in the virtual reality of a game engine. Rather than picking up expensive camera equipment, or spending months painstakingly tweaking even more expensive 3D packages, Machinima creators act out their movies within a computer game. Growing up, I was a big fan of Sid Meier‘s excellent line of games for Microprose (now bought out by Atari). One of my all time favorites was Sid Meier’s Pirates!, and countless hours were spent raiding the Spanish main, boarding hapless merchantmen, avoiding the dreaded pirate hunters, wooing the governor’s daughter and memorizing every port and cove in the Caribbean. Now it looks like Sid along with Firaxis Games are creating what looks like a worthy sequel, Pirates of the Burning Sea. It is to be completed late in 2004, and judging from the screenshots, it will be totally stunning graphics wise! I just hope my PC will be able to run it, and if not, I’ll just have to upgrade again… Here are a few previews: GameSpy, Gamer.no. A few days ago I found that Matrix Games have released version 8.0 of Steel Panthers World at War, in my opinion one of the very best turn-based strategy war games ever made. It is based on the classic Steel Panthers series by SSI, which was taken over by Matrix Games and released as a free (!) game. It has much improved graphics and game-play over the original games, as well as has a large user community of players that discuss tactics and help each other out with issues. I highly recommend trying out this game for other strategy interested people out there! Bored at work or at a meeting, and no games installed? After the Excel 97 Flight Simultator comes another work productivity destroyer/booster: Pacman and Space Invaders for Microsoft Excel! These are a lot of fun, and even have authentic sounds and intro screens. Warning: The games are CPU heavy, so you will need a fast computer to play, as well as macros enabled in Excel.